Light-hearted in tone but faithful to the facts, this readable volume interweaves the story of Cicero's private life and feelings with the development of his public life and his literary output. Details and commentary on Cicero's speeches, letters, and philosophical writings highlight the events in his world which served as background for some of the most poignant, as well as the most dramatic, writing ever done in Latin. Williams shows the human side of the renowned orator and thereby allows the reader to savor Cicero's dreams, disappointments, and pursuits. Students will enjoy this volume that completes the gaps in a student's knowledge of Cicero. The ethical principles that propelled the orator to courageous and ultimately fatal undertakings are told with memorable twists of language that offer comic relief and enhance the appreciation for Cicero as a total person. An extensive glossary explaining customs and practices such as salutationes and the Lupercalia along with a timeline of Cicero's major works and the events of his life make this book an invaluable resource for both students and teachers. Rose Williams, Cicero the Patriot. With separate Teacher's Manual. Wauconda, IL: Bolchazy-Carducci, 2004. Pp. 90; 70. ISBN 0-86516-587-4; 0-86516-588-2. $10.00 each (pb). Reviewed by Rex Stem, Louisiana State University (sstem1@lsu.edu) Word count: 1491 words The most appreciative reader of this crisp account of the life and writings of Cicero will likely be the intermediate Latin student, struggling to read Ciceronian fulsomeness for the first time, sensing its art and yet frustrated by its length and complexity. This book seeks to be the antidote to such frustration: a readable and brief narrative account of the man behind the syntax. Rose Williams writes with energizing wit and deflating humor, all the while telling the story with sincerity and conviction, and she succeeds admirably in making Cicero an accessible and even likeable figure. The Younger Seneca once joked that Cicero praised his consulship "not without cause, but without end," and Williams has taken to heart both halves of this bon mot. She backs up her claims for Cicero's achievements and yet she does it in only 90 pages. The pace and tone of Williams' narrative make it appropriate for students from middle school up to college level, where it could supplement the texts read in an Intermediate Latin class, or even provide a quick tour in an Introduction to Roman Civilization class. The works of Cicero are so caught up in the events of his life, and in the political culture of his time, that some contextualization of his writings is necessary for students to appreciate them, and this book provides an enjoyable means of doing so. Williams' short chapters form very manageable units for a middle or secondary school classroom, and the separate Teacher's Manual offers both "Thought Questions" and "Quick Test Questions" (with sample answers) for each chapter, as well as suggesting report topics and/or offering further background information. Williams demonstrates throughout an appealingly practical perspective. A great strength of the book is its tone of irreverence, which emerges immediately. Already on page 1, where Williams explains Cicero's equestrian background, she declares that the equestrians were "Next to the Top, or Second Best, and nothing gives people the heebie-jeebies like being Second Best." Giving people the heebie-jeebies is rarely an act that students find in their schoolbooks, but it may well please them, as it did me, to find it here. Moreover, such a sentence all but invites discussion about how the heebie-jeebies manifest themselves, and what they have to do with class and status awareness in a highly public and stratified society. In other words, such a sentence startles the reader into discussion, which is just what teachers desire. Another example (and I noted many more such examples as I read) where the writing will likely help in generating discussion is Williams' account of Clodius' scandalous presence at the exclusively female rites in honor of the Good Goddess: the hostess was Caesar's wife, who "was Sulla's young and featherheaded granddaughter Pompeia. Clodius was not called 'Pulcher' (Gorgeous) for nothing; no doubt he looked charming in his stola. Nevertheless he was discovered in women's dress during the festival, and the ladies turned him in amid much shrieking. Those who loved scandal said he could never have gotten in without a little help from his hostess, and wondered just what sort of persuasion he had used on her" (pp. 35-36). This is all very tactful while emphasizing the scandalous nature of Clodius' act. The characterizations are deft and the issues of transgression apparent. The language is not intimidating at all, and yet the scene will likely stay with the reader for some time. And a student might even ask what exactly a stola is, and why that is the garment named here. Williams' structure is traditional and chronological. She breaks the story of Cicero's life into 15 short chapters and tries to include political, literary, and family events at each step. Each chapter is introduced by an apt ancient quote, in Latin and in English. She chooses her anecdotes well, and the joke of one chapter is often relevant again in a later chapter. She draws primarily from Cicero's own corpus but also from other relevant contemporary works, such as Sallust's account of Catiline, or Caesar's account of the besieged Quintus Cicero in Gaul. She is fond of the humorous and generalizing parenthetical aside, in which she often points out the timelessness of the judgment within the story. Cicero's house on the Palatine, for example, cost "an incredible amount of money. (This incredible amount of money was three and one half million sesterces. As monetary worth is the most fluid of measures, that doesn't tell us an awful lot today. We can only say that Cicero, like so many of us, subsequently discovered that it was much more than he should have spent)" (pp. 31-32). Such a parenthesis is much better than simply reporting the sum, for the humor of the modern parallel enforces the wisdom of the fluidity of monetary measures. The book is easy to navigate. Terms in the text that are explained more fully in the glossary (where the jokes keep coming) are noted with an asterisk. There is a full chronology of Cicero's life and writings in an appendix, as well as a summary chronology on the inside back cover. Cicero's major speeches are also discussed in the text itself, most fully in the chapter on Catiline (presumably because most Latin classes start by reading the first of the speeches against him), and the most significant rhetorical and philosophical works are also included in their appropriate places. Williams is, however, perhaps too accepting of her sources. Catiline and Clodius are entirely despicable, Cato is entirely honest, Cicero's wife Terentia a bit of a pill, and his son largely spoiled. All that is what Cicero says about them, of course, but likely not the whole story. Family matters especially seem rather negative throughout Cicero's life, which may well simply be the nature of the evidence, i.e., family problems made it into his letters when there were issues to be dealt with, while the good times went unmentioned. It is probably too much to ask for source criticism in an account whose virtues are humor and brevity, but questioning the sources is something that a teacher would want to bring up in discussion. Consider Williams' characterization of Caesar just after crossing the Rubicon: "Even if Caesar was no great mathematician, he had enough arithmetic to know that every time either side in a civil war killed a man, Rome was a soldier short. Thus he was extremely reluctant to engage in civil war, being well versed in the horror stories from the time of Marius and Sulla." (p. 68). It would be salutary to note to one's students at this point that the main ancient source for this view is none other than Caesar himself. Only a very few statements in the narrative struck me as misleading, such as the claim that Cicero's first speech against Verres was "so damning that Hortensius threw out Verres and his case, and Verres went into exile" (p. 14), when all we really know is that Verres went into exile. Another misleading sentence puts the proscriptions of the Second Triumvirate after Philippi: "When the battle of Philippi had taken care of the major conspirators, the Triumvirate published a proscription list of Romans who were to be murdered and whose property would be confiscated" (p. 77). There are also a few typographical mistakes (vel sim. ): Silenus for Silanus (p. 29), Eborones for Eburones (p. 55), Pindenissus for Pindenissum (p. 62); Sallust's monograph is mistakenly called the Catilinae Conspiratio on p. 11 of the Teacher's Manual. The Bibliography at the back of the Teacher's Manual (p. 69) is dated and rather surprisingly omits the major biographies of Cicero, all eponymously titled: David Stockton (1971), D. R. Shackleton Bailey (1971), Elizabeth Rawson (rev. ed., 1983), Thomas N. Mitchell (1979 and 1991), Anthony Everitt (2001). Overall, though, the book is well written and edited, cleanly produced, accurate in its facts, and successful in its goals. "I think you ought to know what I have accomplished," Cicero is quoted as saying on the cover of this book, and the tag is quite fitting. He is right that you ought to know what he accomplished, and yet the fact that he is willing to tell you so openly sets him up for a little teasing. Williams steps into the breach with a light touch that comes from familiarity but not contempt. She is not seeking to be iconoclastic, just to remind us that self-importance need not be taken too seriously, even when it is justified. "A man such as Cicero, keenly aware of his personal gifts and the contributions he had made to his society by those gifts, did not appreciate being sneered at by some chinless wonder of the aristocracy. It is not surprising that he trumpeted his own successes; he felt that somebody needed to, and shyness was never one of his faults" (p. v). Thus does Williams entertainingly bring Cicero into the modern classroom in a way he has not entered before. Cicero the Patriot, by Rose Williams, is an amusing anecdotal look at the life of one of Rome's most versatile late Republican figures, Marcus Tullius Cicero. In the same humorous vein as her The Labors of Aeneas - What a Pain It Was to Found the Roman Race, Rose Williams puts the great Roman statesman firmly in his place, beginning with an introductory quotation from Seneca about Cicero, which Williams translates for the reader as, "He praised his own achievements not without cause but without end." There are fewer than one hundred pages in this Bolchazy-Carducci book, although there is a companion teacher's volume which I have not seen, that presumably doubles the heft. However, one of the virtues of Cicero the Patriot is that it is short. This is a virtue because, although there may be billions of words that could be expended on Cicero's style or the pivotal events that he witnessed, longer popular biographies -- like Anthony Everitt's Cicero -- need to explain so much of the background in which Cicero was peripherally involved, that they wind up as biographies of Caesar or general histories of Republican Rome. Cicero the Patriot stays on topic. Williams discusses Cicero's remarkable rise to power (in chapters entitled "A Star is Born," "Polishing the Gem," "Making a Name," "Getting to the Top," and "Up Through the Offices"), his term as consul and savior of the country (in "The Catiline Affair" and "The Rewards of Victory"), Cicero's precipitous fall and his hostile relations with Clodius the Beautiful (in "Judgment Day" and "Paying the Piper"), and his return to Rome, his literary career and his relations with contemporaries like his confidente Atticus, and the (other) big names, Caesar, Pompey, Mark Antony and Augustus (Octavian). Williams also chronologically presents the materials that Cicero produced in great abundance, thanks to his secretary, Tiro. She gives some advice to would-be students suffering from rising blood pressure while trying to keep straight his similarly titled De oratore, Brutus (or De Claris Oratoribus) and Orator ad M. Brutum. Not only is the presentation chronological, but she gives insight from his life's experiences at the time to show why Cicero's views in his philosophical work on friendship seem "a recipe for sainthood." Each chapter is headed by a quotation, many of which could be summed up by the quotation from the man himself that appears on the cover: "I think you ought to know what I have accomplished." Yet despite Cicero's obvious pomposity, he has endearing traits that Williams points out. Besides the obvious virtue of being a patriot who loved his country, Cicero very willingly took the blame when it was his and admirably administered as proconsul a previously plundered province he didn't even want. At the end of the narrative, there is an appendix which serves as a glossary of unfamiliar terms, as well as a timeline of events in Cicero's life. At the end of the narrative, there is an appendix which serves as a glossary of unfamiliar terms, as well as a timeline of events in Cicero's life. 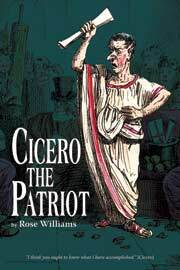 Cicero the Patriot Student Text and Teacher Manual Cicero The Patriot Student Text Light-hearted in tone but faithful to the facts, Rose Williams interweaves the story of Cicero's private life and feelings with the development of his public life and his literary output. Details and commentary on Cicero’s speeches, letters, and philosophical writings highlight the events in his world which served as background for some of the most poignant, as well as the most dramatic, writing ever done in Latin. Williams shows the human side of the renowned orator and thereby allows the reader to savor Cicero’s dreams, disappointments, and pursuits. No matter what Latin text of Cicero is being studied, this slim volume is the perfect ancillary. Students will enjoy this English account of Cicero’s life that completes the gaps in a student’s knowledge of the great orator.. The ethical principles that propelled Cicero to courageous and ultimately fatal undertakings are told with memorable twists of language that offer comic relief and enhance the appreciation for Cicero as a total person. An extensive glossary explaining customs and practices such as salutationes and the Lupercalia along with a timeline of Cicero’s major works and the events of his life make this book an invaluable resource for both students and teachers. Cicero The Patriot Teacher’s Manual The teacher’s manual to Cicero the Patriot is an indispensable, timesaving tool for busy teachers. A veteran teacher herself, Williams includes what teachers need. FEATURES ÿ Additional information on Cicero’s life, time, and works ÿ Suggestions for study enrichment ÿ Sample report topics ÿ Thought questions for discussion or essay topics ÿ Quick test questions by which to test the student’s comprehension of the book that are on reproducible pages ÿ Answers to thought and quick test questions ÿ Bibliography The suggestions and questions in the teacher’s manual serve as a guide to leading students to understand Cicero, the total person, as a “pater patriae,” philosopher, orator, ethicist, husband, father, citizen, soldier, and government administrator. Light hearted volume interweaves the stories of Cicero's private life and his political and literary career.